Testing any yacht designed and built by Camuffo means spending a whole day with some of the most experienced people in the yachting community. When we came back from sea, before the inescapable sundowner, Marco Camuffo remarked: "we never go out looking at boats as they really are; we are always fiddling with cameras and lenses". And then he took me to watch the immense creature beautifully gliding past the docks and privileged me with two of his ideas on what "boat" means (it is remarkable that the last descendant of a family that build boats since 1438 still has the love and the genial inspirations to build such a perfect craft as this C60). "Most yacht-builders always consider weight simply as a mean to level the boat. On the contrary, weights are essential. They make the boat plane, determine the boat's centre of gravity, which generates balance in high swell: this is why weights must be placed where the hull is lifting." Camuffo, what do you mean by a "lifting hull"? "A lifting hull is where it carries the weight, a hull with variable ribs and certainly not a single-angle Hunt-type hull. Ribs are the heart of the hull, they are individually built, each and everyone different form the other". "One cannot distribute weights haphazardly as with a slope at the sides of the hull in the area of the centre of gravity larger than 25°, one can obtain phenomenal results on planing speed as long as there are no weights abaft"
"They are not only my crafts' enemies, but everyonès.. Today's trend is to build house-boats, yachts that navigate in harbours; but when they go to sea, especially in the Adriatic where the short swell demands a low centre of gravity, there comes the problem. I don't want to impose myself, but having designed 45 types of hulls, each different from the other, and considering my father first conceived the variable geometry hull in 1910, I believe I know my business, and results are here to prove it. Competitors world-wide, today, for a weight of 30.000 kg. use engines burning 400 to 600 litres per hour. Any boat of that size from my yard would burn 160-170 litres per hour, and this is due to the shape of the hull and the weights being positioned at the right place, depending on the construction of the yacht itself". What if a customer wants something which does not conform to your ideas? "You see, these are hard times for the yachting world: we try to better understand one another with a bottle of good, dry white wine from Veneto Then he goes his way, and I go mine: but my way to the sea is six centuries old". This is quite an unusual test for a yacht, but when one speaks of a craft designed by Camuffo it is hard to recite data and materials: yachts manufactured by Camuffo (and this C60 is no exception) are as unique as their hulls are: navigating on courses and performance, as far as speed and consumption are concerned, that baffle any technical speculation. 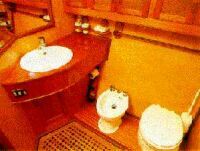 They are incredible boats and, as for this, a yacht conceived by Camuffo must be felt and experienced as a whole: in the comfortable and healthy environment created by the most attractive timbers, carved and refined by the most talented master craftsmen. Reader can go on looking at the specifications, especially the ones regarding the performance and consumption: these are just some of the several keys one has to fully understand a yacht conceived by Camuffo. Draft below propellers: 1,40 m.
Fuel tank capacity: 3.200 lt.
Construction and supertructures: marine ply superlaminate, 20mm thick, 19 layers, side planking in khaya and sapeli. Bottom in beech and sapeli. Deck: 15mm. solid teak on mahogany base from 10 to 7 layers. 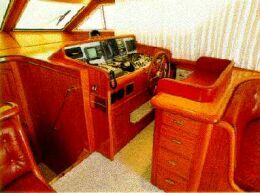 Flying bridge: teak decks, instrument panel, three-place settee, pulpit. 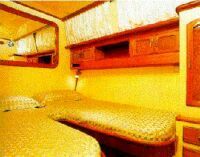 Galley area: to port of the ladder leading to the cabins; deep dual sinks, 2 gas +2 electric burners stove, fridge, oven, dish-washer, lockers, drawers and cupboards. 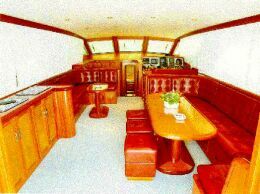 Standard equipment: air conditioning, 9 kW generator, separate Hi-Fi stereo CD and TV colour in the dining area, boiler. Docking manoeuvrability: really excellent: we have docked in very limited spaces and both manoeuvrability and deck equipment and room proved to be just excellent. Accessibility of the engine compartment: very good, the engine room features excellently dimensioned components.